I couldn't help myself! 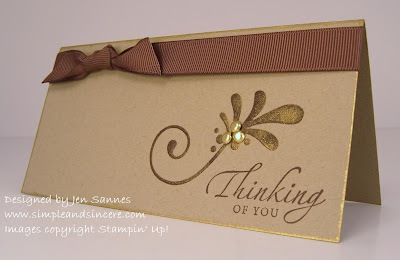 I had to make one more card for this week's CAS challenge, which is to use brads or eyelets on your stamped creation. I've been itching to use my new stencils from SU! 's Decor Elements, called Vintage Ornaments I. This set comes with several ornament stencils and different flourishes you can add to jazz them up. Very elegant and pretty... I'm hoping to play around with the stencils some more this week, so be on the look out for some more stencilled creations. To create the golden look on this flourish, I used my sponge dauber to shade in the stencil with Chocolate Chip ink first, cleaned my stencil, and then used a small stencil brush with my Encore Gold metallic ink pad to add some gold shading over the top of the Chocolate Chip layer. It looks to sparkly and elegant in real life! I also swiped my gold ink pad along the edges of the card. I used three gold brads in the center of the flourish, which makes it look more like a flower. I can't wait to play around with this some more - so many possibilities! So very lovely and elegant...those stencils are very interesting...I love what you did with it!!! This is the most simple card ever, but so elegant. That gold over the chocolate chip gives it a very soft velvety feel. Great job. Your card is so stunning - I really love it!